I’ll thprint and thprint and thprint until I’m thick! Sprinting. Nothing to it – just riding as quick as you can, right? If only. Any number of important factors must fall into place before you can hope for success in the bunch gallop that concludes most flat course cycle races (especially at 4th Cat level). First, you need to be able to sprint. By that I mean to get your hands clasped firmly on the drops, your bum out of the saddle, your chin on the stem, your gear as high as possible (ideally top) and then put sufficient power through the pedals to accelerate from whatever speed you were doing to one much, much faster. And then hold that position for several hundred metres even as your lungs and leg muscles cry “Enough!”. Then of course you need to be in the right place to make your final burst of effort pay off to the maximum, ideally with a win. That’s such a fiendishly difficult art/science to master I have neither the experience nor the space here to even touch on it. The last point being something of a natural by-product of achieving the first three, of course. During several evenings at the excellent Preston Park Chaingang I’d been able to sprint more frequently, slowly coming to terms with the awkward position it required my stiff, 6’6” frame to be contorted into. What began as a concept so alien it had formed a serious physical/mental blockage slowly started to become, if not second nature, then at least something possible. 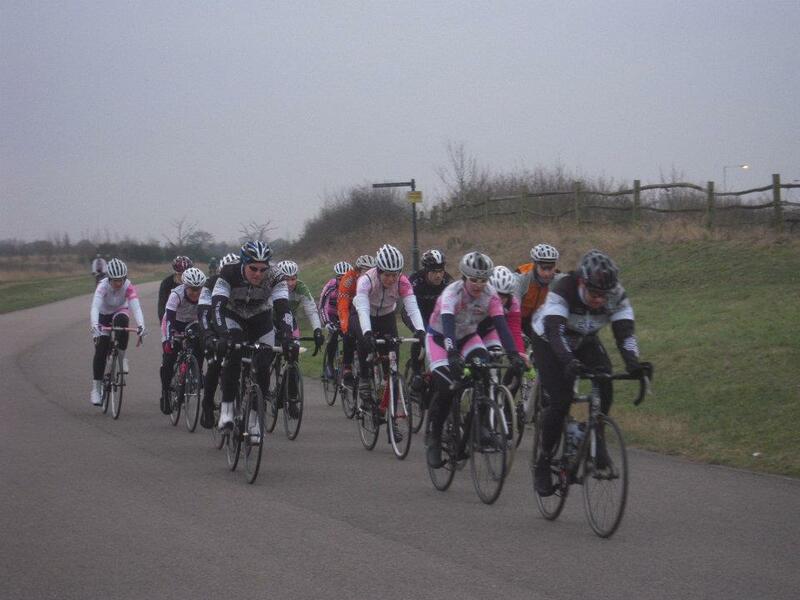 And so I found myself with teeth chattering and extremities frozen at Hillingdon Cycle Circuit in West London yesterday, taking part in the SprintFest, an afternoon of sprint-specific training put on by the cycling coach John Leitch. Though the temperature had actually clambered above zero by the time we started, demonstrated by the rivulets of snow melt that started trickling across the track as the day progressed, it was a chilly day for such a stop/start activity as sprint training. The initial format saw us split into smaller groups to ride one lap of the course with a sprint at the end. However, after a couple of initial efforts I had a bit of a funny turn and almost puked by the trackside, leaving me able to do little more than tap round the next one-lap effort. I put the blame on the combination of cold air, my recent time off the bike, the effort I’d put in on one particular long-range dash, plus the shock of the new. It wasn’t a good feeling, though, and I almost bailed out altogether. However, after another half-hearted run the nausea started to wear off and I got back into some sort of a groove. Following a little practice at bumping each other without falling off (see photo), we repaired to the club house to defrost and compare notes. After this much-needed little break things really started to fall into place as we undertook the next session of lead-out training. Working with my new club mate Chris as my lead-out man I really started to get into it, pulling all the different technique elements together and feeling both smooth and powerful as I did so. 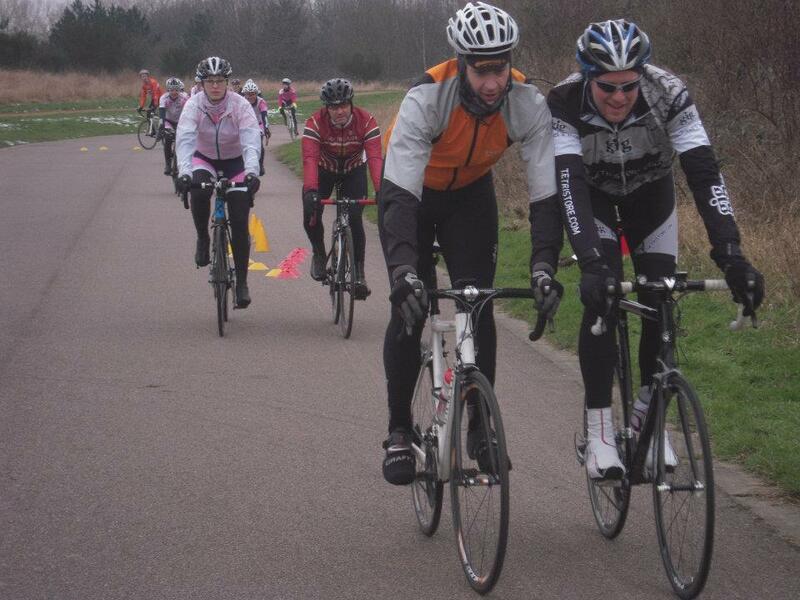 The bar wobble had vanished and I managed more than 200 metres out of the saddle; a massive step-up from last year. My terminal velocity of just under 33mph won’t win me any Tour de France stages, but with the right jump and from the right position it should make me more competitive among the 4th Cats. And that’s all I can ask at this point. So now, what happens next? I don’t feel in tip-top shape, my recent business trip to Oman putting paid to any proper training for more than a week, but I can’t help looking at the circuit races at Portsmouth’s Mountbatten Centre this coming Sunday and becoming sorely tempted. I have the itchiest of feet, Mountbatten suits me far better than the evil Cyclopark and the weather forecast is improving. On the flipside, a poor showing due to lack of fitness would be an inauspicious start to my second racing season and the all-consuming quest for 3rd Cat-dom. This entry was posted in My road racing. Bookmark the permalink. 1 Response to I’ll thprint and thprint and thprint until I’m thick!